Sublimation is a versatile and appealing garment decoration method. It’s also a great way to decorate hard surface items ranging from cell phone covers to ceramic tiles, mugs and hundreds of other polymer-coated items. And it’s the king of softness in T-shirt transfers. But it does have a few limitations. The main drawback with sublimation is the limitation to white or pastel polyester. No black cotton tees. CMYK Process color just doesn’t work on black, brown, or Bordeaux. The less well-known limitation of any CMYK printer is the lack of ‘bling’. I know that sounds silly but these days bling is big business. 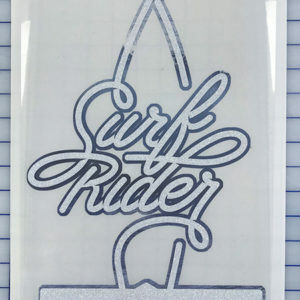 The public’s desire for metallic effects on apparel is indicated by the enduring demand for glitter heat transfer film. What’s a sublimation devotee to do? You don’t have to throw away your SubliJET printer. You can still get in the game because one of the polymers you can sublimate is glitter heat transfer film. Glitter sticks to cotton and covers the color. 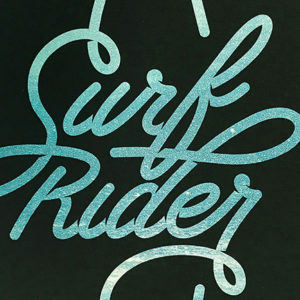 This means not only can you use your SubliJET HD ink on a black cotton shirt, you can add a dazzling metallic effect. Here’s what you need to know about sublimating glitter heat transfer vinyl. Before we cover the how, perhaps we should talk about why. Why would you want to mess with thick, heavy glitter T-shirt vinyl when you’ve been selling uber-soft polyester apparel? Take a stroll through the nearest Walmart menswear department and the answer is obvious. Folks want dark shirts. Stroll through the ladies wear department and you’ll see the timeless appeal of bling. Rhinestones, glitter, etc. If you can use your sublimation system to decorate dark apparel, and add metal flake effects, it opens up a whole new market. The process of using glitter or bling heat transfer film as a base for sublimation is similar to using EnduraTex SubliTEX, but simpler. Because you’re not trying to cut out a pre-printed image, you don’t need a contour cutting plotter. You don’t need special software to add registration marks and coordinate the printing and cutting. Your dye sublimation printer and a regular vinyl cutter will do. You cut, weed, and apply the glitter graphic. Then sublimate it. Here’s the step by step summary. Design the glitter decal in your vector design software. Remember to reverse the image before sending it to the vinyl cutter. Cut it with a 60° blade and weed away the excess. This is the base for the sublimated image. Place the bling appliqué ‘right reading’ on the shirt and cover with a Teflon sheet. Set your heat press for 365°F and set the pressure to medium-firm. (This is higher than the normal application temperature for the vinyl. It’s the threshold for sublimating the film after the initial application). Press it just long enough to activate the adhesive so you can peel the liner. About 5 seconds should do it. Print the color overlay from your sublimation printer. Make sure it’s larger than the cut file, so that it’s easy to align. There are a few ways to do this (See tips below). Place the printed transfer face down on the glitter and cover both with a sheet of copy or Kraft paper. Press for 60 seconds at 365° F with medium-to firm pressure. Remove the sublimation paper and you’re done. If you’re using a dark cotton shirt, only the glitter appliqué will have been sublimated. FIG 1: Use an outline to create a print file just a little larger than the cut path. Design: You don’t have to add registration marks, but you do have to consider how to align the printed sublimation overlay with the cut file. There are a couple of ways to do this in your design application. If you’re using LXI or Flexi, you can design the cut file for the bling first. Then add an outline with a significant offset. 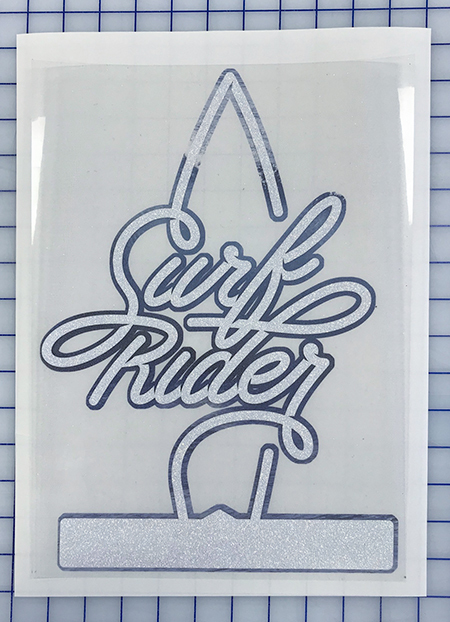 Separate the outline and use the fill tools to turn that into the printed element and send it to your dye sub printer. In Photoshop, you can import the cut file and select it. Then enlarge the selection by 25 pixels or more to print an image that’s roughly the same shape as the glitter decal. This will give you enough of a bleed to make alignment easy. (Fig 1). Application: Use only white glitter. Sublimating colored glitter or bling will be like trying to sublimate a colored shirt. The colors in your design will shift, perhaps in unexpected and unpleasant ways. Here’s why. EnduraTex Bling offers several interesting choices in white-red, white-blue and white-emerald. All of these have specks of color mixed in with the white. Depending on the color of your printed overlay, that may help or hinder the overall effect. Rainbow white has an iridescent metal flake added for a subtle prismatic effect. Alignment: Since sublimation transfer paper isn’t transparent, you may have a little difficulty aligning the print over the applied glitter decal. You may need to trim the print with scissors to see more clearly where the ink border aligns with the cut. Or if you’re not concerned about the ink and media cost, you can just print a full sheet and lay it on top of the vinyl. Dye Sublimation Printer: If you’re starting from scratch, you’ll need a dye sublimation print system such as the Sawgrass Virtuoso SG400, SG800, or VJ628. Vinyl Cutter: You’ll also need a vinyl cutter that can handle 12 mil film. Glitter takes a little more force than most Heat transfer film, so a craft cutter won’t cut it. Pardon the pun. Any of our 24” plotters will work. If you want to design fine intricate details, choose one with a digital servo drive. You can start your comparison shopping here on the blog, or here if you just want everything boiled down to specs. Heat Press. This is not an iron-on process. You’ll need a heat press. You don’t need anything fancy. A swing away or clamshell press will work. Just make sure it has good temperature controls so that when the screen or dial indicates 365°, it’s really at 365. Our EnduraPRESS models excel at this. They’re generally accurate to within 5 °. You can pay a lot more for a press that’s not as well calibrated. If you already have a heat press, but the display is suspect, get one of these and dial it in. Glitter/Bling: Last but not least, you’ll need a roll or three of white glitter heat transfer film. The standard roll width is 20 inches. 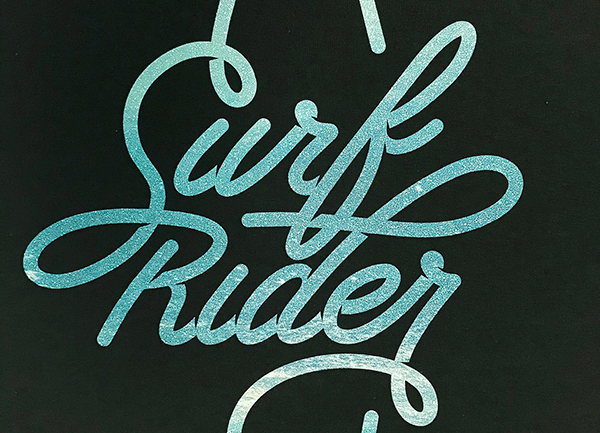 Paired with an SG800 that handles 11“ x 17” sheets, you can make some big bold transfers. If you already own a sublimation printer, a vinyl cutter and a heat press, just get yourself some white Bling t-shirt vinyl and get creative. Think outside the white polyester box. Sublimating glitter is the simplest kind of print and cut t-shirt transfer. You add the color after the cut vinyl is already applied to the garment. The finished appliqué offers the vivid color of dye sublimation, and the unique enduring appeal of bling.